Illustration Friday: Dream This weekend I had a tremendous experience that I don't know if I could do justice to here with a limited amount of space. Suffice it to say, I made a request of God and it was filled INSTANTLY, in a very personal and humbling and visual way. While writing down the experience and the dream that preceded it, ideas for paintings came POURING out onto the paper, images I'd carried with me for years but never seriously entertained putting down. I think all in all there were 11 of them and 7 or more were all on the same theme - it occurred to me I could have a showing of all of them, and tell the stories that went with them. All very uplifting and hopeful. 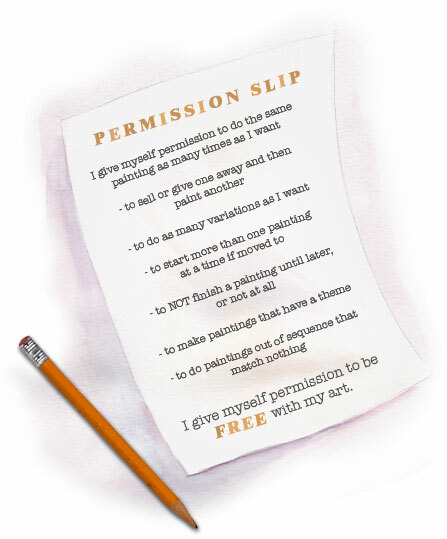 I also felt the urge to write myself a permission slip - and again, the words came tumbling out onto the paper. Permission to paint whatever I wanted, for myself. Permission to paint the same picture as many times as I needed to - big, small, different mediums - maybe they'd be easier to let go of if I had more than one to give away or sell! I put a big dotted line around it and boxed it. I think I was giving myself permission but it was God's hand guiding the pen. I wish you inspiration and love and the power to give yourself permission to do whatever it is you're afraid to do. Doors are opening.